The versatile HP iPAQ hx2100 Pocket PC allows you to maximize Personal productivity through the use of Email, Calendar, and Contacts. It also comes equipped with Bluetooth wireless technology to allow you cable-free connections to other devices with Bluetooth technology such as printers or phones. 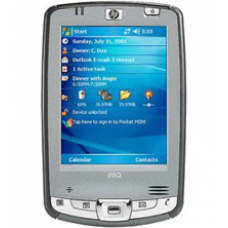 Box Contents: - GRADE B HP iPAQ PDA Refurbished - Removable/Rechargeable Lithium-Ion Battery - USB Sync Charge Cable - Stylus Main Features: - 128 MB total memory (64 MB ROM and 64 MB SDRAM), up to 65 MB Persistent Storage Memory - Processor: 312MHz Intel PXA270 Processor - Power: Removable rechargeable 920 mAh Lithium-Ion battery. - Transflective Colour TFT LCD [64,000 Colours] - Screen Dimensions: 240x320 pixel touch screen - SDIO Secure Digital Expansion Slot - also works with MMC [multimedia cards] - Compact Flash Type II [CF] Expansion Slot - also suitable for Microdrives - 3.5mm Headphone Jack - Microphone/Speaker can be used as a dictaphone - Dimensions: [w]76.6 x [h]119.4 x [d]16.3 mm - Weight: 164.4g Software: - Windows Mobile 5.0 - Contacts - Calendar/Appointments/Reminders - Notes/Tasks - Mobile Word - Mobile Excel - Mobile Powerpoint - HP ProtectTools - Data/Device Security Software - Mobile Internet Explorer For more details about iPAQ Repair and Parts grading system for refurbished units, click here to view our handy guide.